If you live in India it’s likely you use LPG gas cylinder for your cooking fuel needs. But are you aware of the risks involved in using LPG, and the measures you can take to make sure your home is safe from fire hazards. With all the worries of the modern life, it can be easy to be unmindful about your LPG cylinder installment. It’s possible that the staff of the corporation who first installed the cylinder in your kitchen was callous, increasing the chances of an accident. Here are a few things you should check to make sure you are safe. Your cylinder should be placed on a clean, dry and level surface. It should ideally be on ground level. This reduces the chance of the cylinder toppling over. Your kitchen and the cabinet in which you keep your cylinder should be well ventilated, this will allow the gas to disperse in case of leakage. Make sure any electrical plug points in the close vicinity of the installation are spark proof and well serviced. Short circuits are a leading cause of LPG related fire incidents. It is advised that at least one of the walls of the Cylinder’s cabinet are an external one. This shall reduce the damage to the interiors of the house in case of an explosion. Other than your cylinder the important part of your LPG gas setup is the tube or the hose which connects your cylinder to your stoves. Many unfortunate accidents occur due to improper use, wear and tear and bad quality hoses. Yet, they are easily avoidable, if you keep a few things in mind. When purchasing a new hose make sure its ISI approved, and carry the ISI mark. Try keeping the length of the hose as short as possible, without challenging its elasticity. The recommended length is under 1.5 meters. You are advised to keep the Stove within this specified range. The tube should not get entangled, looped or twisted. The hose should be accessible and it’s recommended you check its condition periodically. Keep an eye out for cracks, holes and softening especially at both ends of the tube. Under no circumstances should the hose come in contact with flames or heat. Make sure it is placed away from the face of your stove. When installing, push the hose in to cover the entire length of the nozzle. Replace the hose every alternative year, especially when you notice that the markings on the tube have started to fade. When cleaning, do so with dry cloth only, don’t use soap or any other cleaning agent, they reduce the life of the tube. If you follow our suggestions and stay vigilant chances of an accident diminish substantially, yet in the unlikely event of leakage, follow these steps. Open all doors and windows for ventilation. Do not turn on the exhaust fan or your ceiling fan to hasten the process of clearing the gas out. Slightest short circuits can cause a fire. Extinguish all flames, lamps, incense sticks in the room. Make sure the safety cap is on the cylinder. 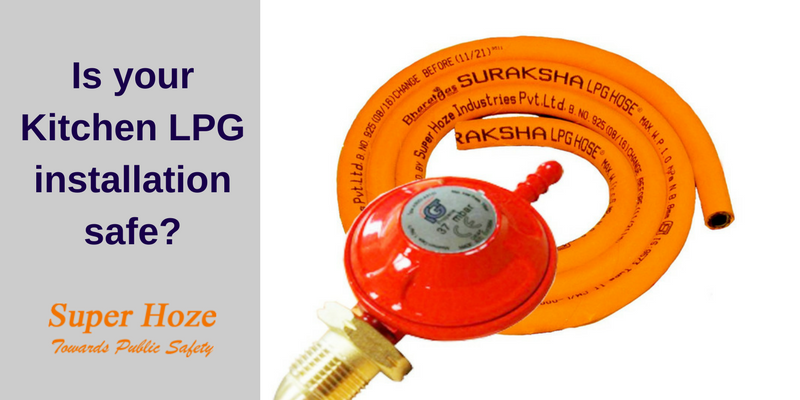 LPG being heavier than air has a tendency to settle at the ground level on leaking, attempt clearing it out with any means necessary except using powered devices. Don’t panic and turn off regulator and all burner knobs. Do not operate any switches or appliances within the room, instead turn off the main electric supply to the kitchen from the fuse switchboard which ideally should be located outside your house. Call up your LPG distributor or an emergency service for additional help. We wish you a safe, and satisfactory cooking experience.